Thousands of clip art files are available that can quickly be converted within our software for cutting. These shapes are in the public domain, and can be used commercially with no royalties necessary. Drawn shapes can be quickly scanned and converted within our software for cutting. Shapes created in other drawing programs can be imported into the Torchmate software and converted for cutting. Shapes can be drawn directly within the Torchmate software. Here an owl shaped drawing was scanned and then converted into a vector image with the Torchmate software. It was then automatically duplicated and nested to fill a 4' x 4' plate. This was done in less than 5 minutes. Next, the Torchmate CNC machine cuts out the entire 4' x 4' plate full of owl shapes automatically from 1/8" mild steel. The finished owls measure approximately 8" x 8", and sell wholesale to dealers for $20 each. The entire run of 33 owls was completed in one hour, at a cost $1.75 each in steel and plasma torch consumables. That comes to $602 profit for an hour's work. As you will be working in a Windows environment about 90% of the time, it is important that you have a basic familiarity with the Windows interface. If you were able to find our web site, you probably have the necessary computer skills to operate our Torchmate system. It took about 2 hours to create this well-known logo from scratch. It should be noted that the Harley Davidson Bar and Shield logo is a trademark of the Harley Davidson Motor Company, and is shown here for illustration purposes only. Once a shape of this complexity has been designed, copies of the actual cut piece can be produced at the rate of about one every 10 minutes. Less complex shapes can be cut more rapidly. Operation of the machine requires no metal working experience of any kind. Assembly requires ability to use common household tools. You will need a private little nook somewhere where you can create your shapes on your home computer. Here, the computer work area has been set up in a corner of a finished basement. This space should be located in an area of your house where you can work at the computer at odd hours without disturbing others. You will carry the files containing the shapes to your shop computer on a floppy disk. If you prefer, the two computers can be networked. 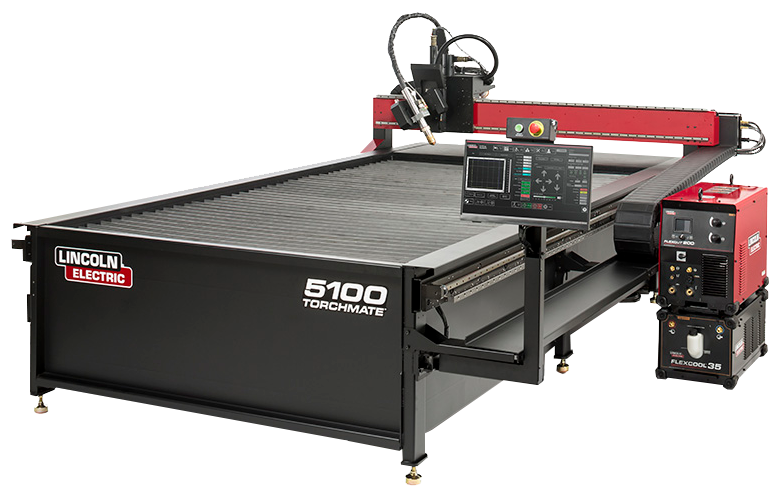 The area where you operate your CNC plasma cutting machine should be away from the main house, to ensure that stray sparks from the process do no damage. Be sure to keep a fire extinguisher handy. You will need a 230 volt power source for your plasma cutter, and 115 volts for the low-end computer that runs your machine. 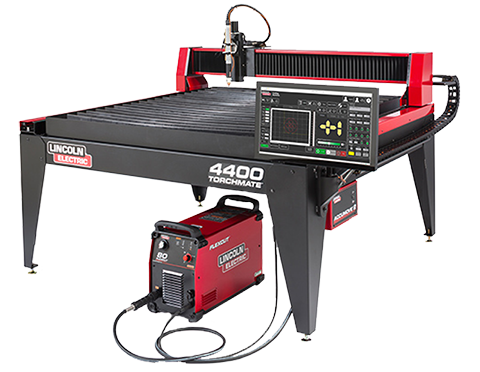 The plasma cutter can run off a standard 230 volt clothes drier outlet, and the machine and computer will use regular 115 volt wall current. Unlike most purchases we make on a daily basis, the purpose of buying your Torchmate system is to make money. Unlike businesses that buy wholesale and sell retail, you will be producing a saleable product at your home from raw materials that cost very little. Thus, your profit margin will be very high compared to your costs. Your only notable expense will be your investment in your machine. There are several distinct markets that you will want to think about pursuing. The most obvious is the tens of thousands of gift shops across the Country, and the independent dealers that sell their wares at arts and craft shows, county fairs, and flea markets. It is best to sell your products through dealers, as their cost in adding your product is far less than your cost would be to pay for a booth or rent a store yourself. 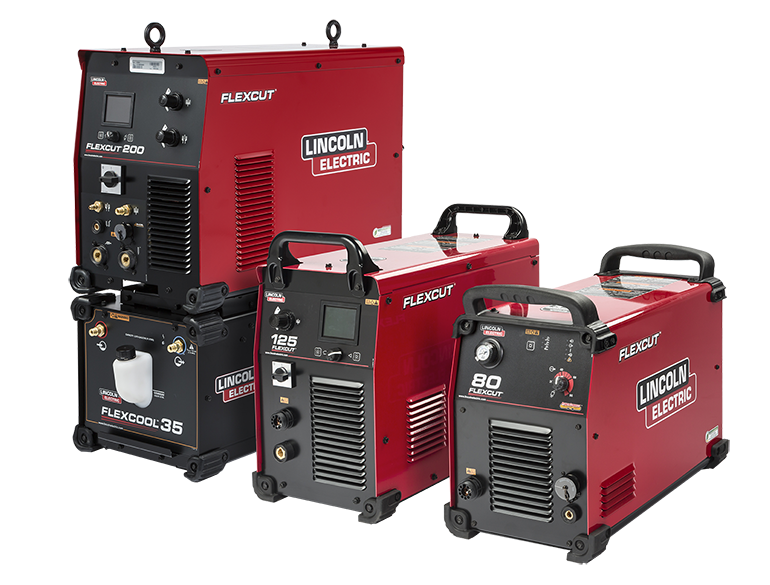 Another market you may not have considered is the small welding or metal fabrication shop. The vast majority of these shops don't have CNC cutting equipment, and have to contract out the cutting of steel brackets. Due to the low cost of your equipment, you can almost always under-bid a large contractor who has to charge enough to pay off his $100,000+ cutting machine. Cut a group of sample brackets, and attach them to a display board. Then visit all the metal fabrication and welding shops within your commuting area. Show the owner your display of brackets, and leave a flier or brochure. Good luck!